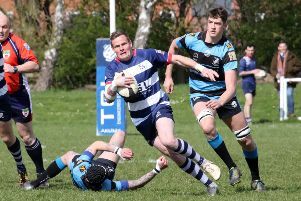 Banbury Bulls slipped to back-to-back defeats as Wadworth 6X South West One East leaders Newbury Blues maintained their 100 per cent record. Despite another great effort from Bulls, Newbury won 18-5 in Saturday’s enthralling contest. Newbury had only failed to pick up a try bonus point in two games so, with Bulls forced into making seven changes from the team that faced Marlborough last weekend including the welcome return of Giles Saar and Jacob Turner, it was always going to be a tough ask. After an even start, it was Newbury who took the lead. Tommy Gray did well to pick off a wayward pass but was penalised for being offside and Kris Ford kicking the ensuing penalty. Bulls had a score ruled out after Ed Phillips snuck over under a pile of bodies but the referee did not have a clear view of the grounding. Newbury extended their lead when Harvey North scored in the corner but Bulls responded well. A rolling maul was dragged down within metres of the line but Turner dragged the ball out before playing in Duncan Leese to score in the corner. Newbury started the second half the brighter of the two sides and from a five metre scrum Alex Millar peeled off the back before crashing his way over in the corner. Joe Mills saw yellow for Bulls after coming in at the side in the red zone. But the Banbury winger could feel hard done by after what looked like a knock-on during the build-up. Newbury got their final try of the afternoon when Tom Hunt scored. The scrum half took a quick tap-and-go before running his way in from close range. Bulls went searching for a converted try that would give them a losing bonus point but could not find their way through a strong Newbury defence. Newbury played some great rugby while Bulls probably had as many trips into the opposition 22 but the leaders were that little bit more clinical where it mattered.